Garmin-Cervélo's three aces – Thor Hushovd, Tyler Farrar and Heinrich Haussler – were unable to deliver a win at Milano-Sanremo yesterday. Two men, World Champion Hushovd and Farrar, were caught up in crashes and Haussler lacked the power to follow the winning move. "After aggressive racing like we saw today, I don't know if everyone expected it to come back for a sprint," said General Manager, Jonathan Vaughters in a press release. "Heinrich wanted to go with those attacks, he just didn't have the legs today. That's even more true after 300km of racing." 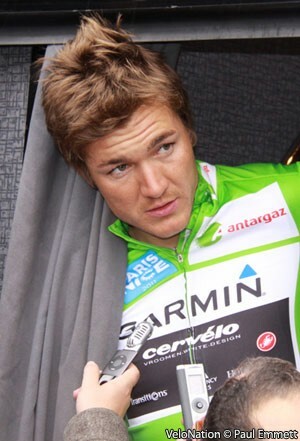 Haussler and Garmin team-mate Andreas Klier were fortunate enough to make the winning 44-man move after the Le Mànie climb. The climb, topping out at kilometre 204, caused disaster for many other race favourites. Hushovd hit the pavement ahead of the climb and on the descent, three-time winner Oscar Freire crashed. Both crashes and a hard pace ahead led to the winning split. "Literally 200 metres before the start of the La Mànie, Thor went down on a crash and that was it, that was his race," added Vaughters. "He spent the entire climb trying to get back to the peloton. By that point, the peloton had split into two parts, so by the time he got back, the race was pretty much over for him." Haussler and Klier carried the weight of the team. Haussler won the points jersey at Paris-Nice earlier in the month, but yesterday was unable to deliver due a weak foundation. Last year, he missed much of the season and didn't ride one three-week stage race due to crashes. When Philippe Gilbert and Vincenzo Nibali attacked on the Poggio, Haussler was unable to pull himself back. He slid out of contention with other sprinters, including Sky's Edvald Boasson Hagen and Lampre's Alessandro Petacchi. "Andreas did a great job helping Heinrich, but with 300 meters to go over the top of the Poggio, Heinrich just didn't have the legs to follow those attacks," Vaughters continued. "It was a little sub-par today, we have to admit, but there was no error on any part of the riders. We had some bad luck with the crash with Thor, but after 300km of racing, that's how bike racing goes." Vaughters said that after the riders raced together in one of the big races, they are ready for more. Next weekend, they will take on Gent-Wevelgem.